1. Preheat oven to 375 F. Spray a 6 cup muffin tin with cooking spray. 2. Nuke butternut squash in the microwave for 2 minutes. Add to a large sauce pan with the garlic, chicken broth, and milk. Bring to a boil then simmer for about 10 minutes. Add salt and pepper to taste. 2. Add the cooked pasta to the sauce and toss to coat. 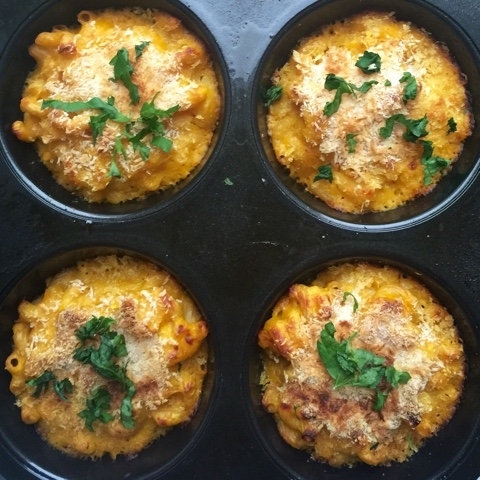 Evenly distribute the pasta mixture to the muffin cups. Top with about 1/2 teaspoon panko bread crumb and then bake for about 18-20 minutes. Turn the oven to broil and cook for about 2-3 minutes or until slightly browned. Garnish with chopped parsley.